Scooter (pictured here on the left) is a nine-year-old male Shih Tzu / Poodle mix. 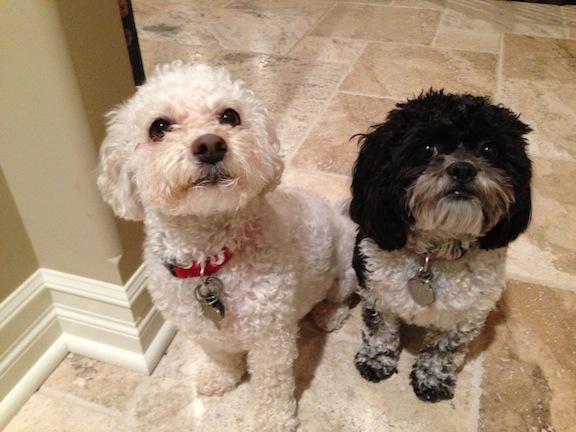 His roommate Bella (on the right) is a one-year-old female Shih Tzu / Bichon mix. Their owner had contacted me regarding a few aggression issues that both dogs were exhibiting, as well as Scooter’s jumping up on guests, marking in the house and possessiveness of any toy that Bella had. When I arrived for appointment, both dogs were barking while standing slightly behind their owner. I noticed a pattern of barking and immediately darting or running away, especially anytime I would move forward. This is usually the case with dogs who are insecure or lack confidence. When I sat down with their owner to discuss the situation, I couldn’t help but chuckle as both dogs immediately jumped up on the couch as if we were sitting down to a social setting or party. These dogs absolutely considered themselves equal with their human counterparts. Whenever I have a client who’s dog has aggression issues, I always ask what rules or boundaries the dog is expected to follow. As is often the case in this situation, the dogs really had no rules in their lives. I’m a firm believer that to have a good relationship with your dog you need to have both trust and respect. Most of my clients have the trust issue taken care of, it’s the respect part they need work on. When a dog doesn’t respect his owner, it’s not going to listen to them when they disagree with the dog’s behavior. The good news is this is very easily corrected, usually with only a small number of changes to the humans day-to-day lives. For example, to dogs the order in which members of the pack eat is related to their rank in the pack. So when we eat before we feed our dogs, we are communicating to them that we have a higher rank or position in the pack that they do. The height at which a dog sits also has a correlation to their rank. By not allowing dogs to sit on the couch, at our level, we are literally saying that there’s a difference status between the two of us. Because these dogs saw themselves as equal or superior to their humans (in terms of authority) I decided to demonstrate a leadership exercise that their owner can repeat to help grow her authority in the dog’s eyes. However as soon as I started, it quickly became apparent that both dogs lacked confidence. While they were curious and playful when it was a casual setting, introducing structure and rules made them unsettled to the point that they went and hid behind their owner. While both dogs knew some basic commands, they only complied when they felt like it. Additionally, they would dart away and bark in protest at anything they disagreed with. These are classic signs of an insecure dog. Since it was clear that Scooter was more insecure than Bella, I decided to focus on him first. I coached their owner through the exercise a few times until she had mastered it. By repeating this exercise daily with both dogs, their owner will be growing and reinforcing her leadership position in their eyes. It will also teach the dogs how to calm themselves, focus and wait for their owner to give them permission before moving forward. After the leadership exercise, I reviewed a few basic commands and training exercises to help with their confidence. Dogs that lack confidence benefit from learning new commands or brushing up on existing commands to built their self esteem. This allows then to take pride in the new skill – obeying their pack leader’s request. It will be equally important for Bella and Scooters owner to practice these commands and leadership exercises daily to build up the dog’s confidence and respect for her as an authority figure. Because the walk can be a great exercise to accomplish both tasks, I put Scooter on the leash and prepared to go out for a short jaunt. I made Scooter sit in front of the front door of the house before I opened it. As soon as I swung the door open, he immediately started to walk forward. I corrected him with a quick talk of the leash which returned him to a sitting position. I swung the door open a few additional times and corrected him each time he tried to get up or move forward. I did this until Scooter was able to sit patiently and not move at all as the door swung open. Not only does this help prevent dogs from running out the door, it’s a great habit for their humans to get into because it’s a easy little leadership exercise that you will practice literally thousands of times over the course of the dog’s life. Once we got outside, Scooter protested a little bit as I don’t think he has ever been walked by anyone outside of his owners before. He attempted to walk in front of me but I corrected him and positioned him beside me in a heel position before continuing. After a few minor corrections, I was leading him down the street holding his leash with two fingers while he walked next to me in a perfect heel. I handed the leash over to his owner and she walked him equally well with only one correction needed. We switched out the dogs and repeated the process with Bella. She was better mannered on the leash and need only one correction the entire walk. I expanded to their owner how beneficial walking can be done in the structured way we just practiced. Walking is literally the only activity that humans and dogs engage in which were both doing the same thing at the same time. Because the human is in control setting the path, pace and duration, it is a great leadership building / reinforcing exercise for any dog owner. While both dogs had demonstrated some aggression issues in the past, they were mild and in my opinion reactive instinct as opposed to intentional aggression. Once their owner takes over the leadership position by enforcing rules with timely corrections and practices the leadership exercise and daily walks, these dog should overcome their insecurities and lack of confidence and learn to stay in a calm, balanced frame of mind, all the time.